You might like to think that deep down, everyone has good intentions. Unfortunately, it’s probably not true. Many people are willing to use you and walk all over you if it means getting to the top. When you’re dealing with a professional manipulator, you often don’t realize what has happened until it’s too late. How often do you get manipulated by others? Are you too trusting? Or can you see a person’s bad intentions from a mile away? People who enjoy manipulating others often search for targets with low esteem. They know it’s easier to get what they want from someone who doesn’t mind acting as a doormat to others. If you are someone who stands your ground and demands respect from those around you, it’s likely that you avoid being manipulated by people with bad intentions. If you are willing to express your opinions and explain your needs to others, you know that you won’t get very far in life by refusing to speak up. When it comes to a manipulator, they steer clear of anyone who’s not afraid to stick up for themselves. It shows that you’re able to prioritize your needs and communicate in order to have your needs met. Manipulators seek out those who are afraid to say no. They purposefully target people who are willing to agree without asking too many questions. If you aren’t scared to tell someone when you are uncomfortable or simply unwilling to agree, chances are you’re safe from those who want to use you to get ahead. A manipulator will often test your boundaries to see how far they can push you. By setting boundaries and explaining the consequences of crossing the line, you are demanding respect and letting people know that you cannot be manipulated. When someone is trying to manipulate you, they might demand an immediate response or immediate action in order to put pressure on you. 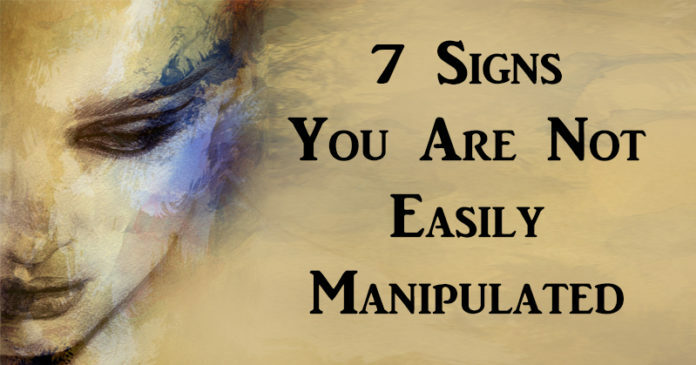 If you’re able to use these moments to distance yourself from the manipulator and you refuse to be intimidated, the manipulator will most likely back off. Manipulators target passive people because they are easier to control. If you set goals and take action, it’s not likely that you’re a target. Knowing what you want and going after it will scare off the people who want to manipulate you. Manipulators play their game because they are good at it. They have had success in the past with using people to get ahead. Being able to recognize someone who is trying to use you and being strong enough to stand up to them will stop a manipulator dead in their tracks. If you’re willing to confront them, they won’t be back for round two.